It’s common that our minds can magnify situations at night causing stress and anxiety, but I believe when this happens we are actually looking at our tomorrow in the strength of our today. In Exodus 16 we read that God sent fresh manna from heaven to the Israelites every morning, but He specifically said they are not to keep any extra for tomorrow otherwise it’ll turn to maggots. In the same way, as God provided strength through manna for the Israelites, He also provides sustenance and strength for you each and every morning. Many times we can often feel differently about our day, week or a situation by the following morning. Why? 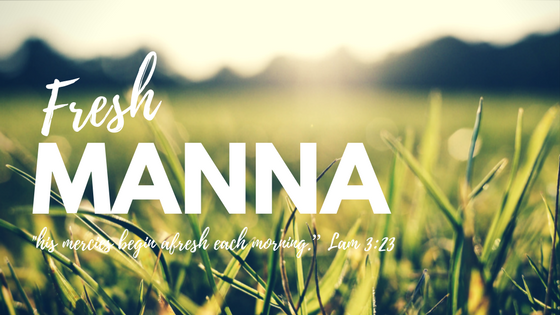 Because we have “fresh manna” to face our today. It wasn’t there last night when you were lying in bed mulling over situations, but each and every morning you wake up to new mercies, fresh manna, renewed strength from our Heavenly Father. Jesus tells us in Matthew 11:30 that His yoke is easy and His burden is light. Whatever you’re facing in your life right now, rest in God’s presence and let Him fill you with His strength. Don’t allow the enemy to invade your first waking thoughts with anxiety but allow your mind to be renewed in God’s word and step into God’s immeasurable grace.